Creating reports is inherent to every social media management activity. At first glance, it may seem like a simple routine task – you pull your best numbers in one spreadsheet, export data from social media tools, and put it all into your template (or borrow a template from someone else). Send the report to your boss or your colleagues – that’s it. If it really were that basic, you wouldn’t be reading this article. The truth is, reporting is one of the most valuable and crucial parts of social media marketing – and it deserves your due attention. Without reporting, you’re going into social media marketing blind. Social media reports show you what works and what doesn’t. Sure, you can see that, say, some of your posts perform better than others, but only a comprehensive report will help you analyze the strengths and weaknesses of your social media strategy. The ongoing reports which provide an overview your progress on social over a certain period of time are essential to revising your strategy. You can also create one-off reports to analyze specific activities like campaigns or contests. Additionally, there are research reports which can (and should) inform your marketing decisions based on social data. Regardless of the type of report you’re creating, the core process is similar. Here are the five steps to follow to generate any type of social media report from scratch. Before you do something, you need to understand why you’re doing it. A comprehensive social media report dedicated to your ongoing activity will reflect whether you’ve hit your goals, how your strategies are working, and what your successes are. It’ll also explain any failures, and show you the ways to address them efficiently. For instance, thanks to your report, you and your team could discover a decrease in your engagement numbers in November and attribute them to either a change in your content strategy or the holiday season. Who will receive the report? How can it benefit them? Think about the decisions your reports are supposed to inform and support. Does the head of sales need to understand how many leads come from social? Does the community management team want to know the efficiency of their strategy? Do you want to convince the head of marketing to invest in video content production? These are just some questions that may come up in your social media marketing endeavors. As you might have noticed, defining goals and recipients go hand-in-hand – who needs insights, and why they need them, are the main questions to build your report around. The period of time covered by your report may depend on the purpose of the report (i.e. a campaign report will cover the timeline of a campaign) or your preferred workflow. At this step, you should also consider how you want to evaluate your progress. Do you want to compare your performance to the previous month (if you’re doing monthly reports)? Or maybe you’d like to see how your key figures compare to those from the same month of the last year? Now that you know why you’re making a report, you can think of what data you need to present. This is truly the cornerstone of reporting, and social media platforms have a multitude of native metrics which can be rather overwhelming, let alone all sorts of data from third-party social media tools. Knowing the purpose can help you hone your focus onto a specific set of metrics which showcases your successes and slip-ups in a chosen area. Here are some of the data points you might want to focus on and the ways to find them. Volume of content is one of the easiest ways to demonstrate to your boss that you’re not just looking at memes on Twitter. In all seriousness, volume of content is quite a popular metric in social media reports, which, paired with others, lets you analyze your content sharing efforts. 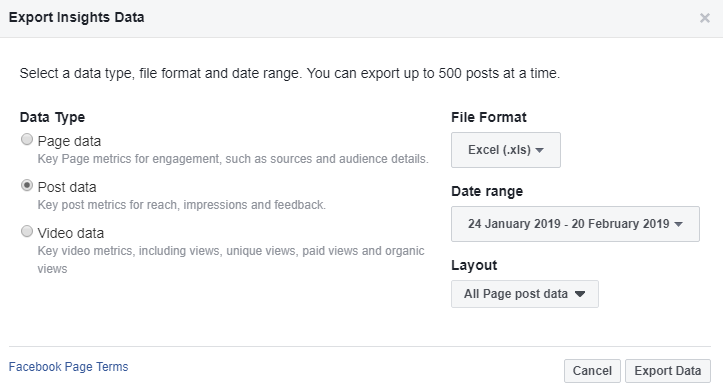 This one is quite unimaginative: you just go to Insights and export the Post or Tweets data for Facebook and Twitter respectively (narrowing it down to a required period of time). 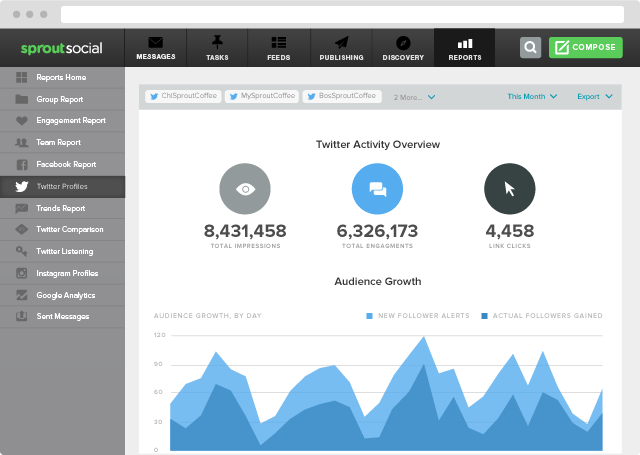 There you will see the rows of your social media updates with columns for individual stats on each update. Simply count the number of rows and you’ll get the results. For Instagram, you can see the number of posts sorted by different filters in your Insights under the Content tab. You can’t choose a custom period of time, but Instagram enables you to view stats for 7 or 30 days, 3 or 6 months, and 1 or 2 years. The reach metric helps you understand the size of your audience. This is a tricky one, since some marketers measure their audience by the number of followers or subscribers they have. However, what you really want to know is how many people see your content, and that’s where reach comes in handy.